Darrynane woodland pond also known as bottom pond! 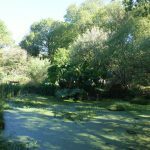 At Darrynane we have three ponds all very different yet all creating habitats for wildlife and flora of which we have many species of each. 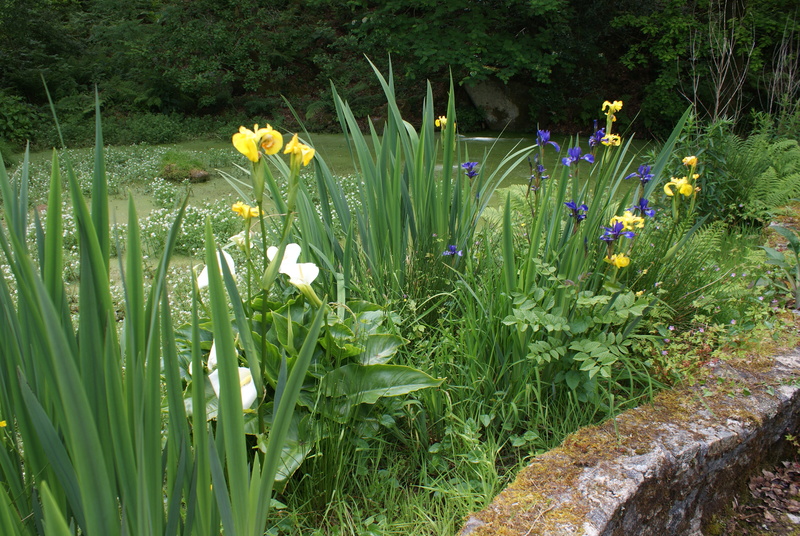 Spring time Lilies around the top pond! The top pond, as we call it, is situated next to Lakeside cottage. 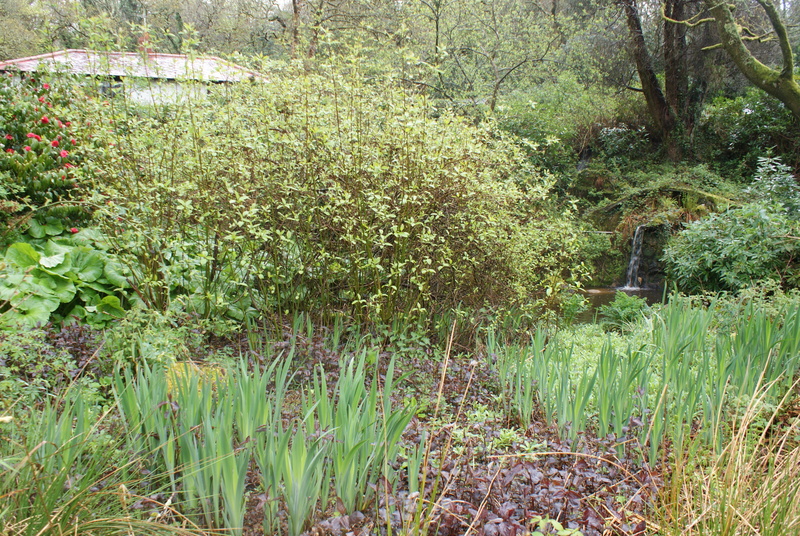 The waterfall feeds a deep pond that flows down the stream into the bottom pond. 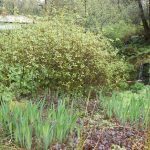 The garden area is full of flora including iris, lilies, Bog Bean, Marsh Marigold, Gunnera and Pond Digger to name but a few. 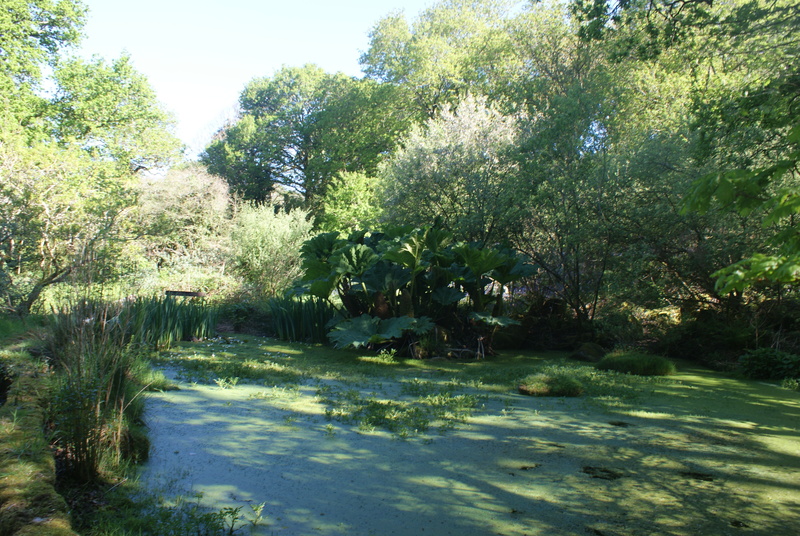 The bottom pond, nestling in the woods has lilies, iris and Water Chestnut as well as a huge Gunnera and many wild plants. The ducks make this their home in Spring time. A few weeks ago one suddenly appeared in our driveway and gradually waddled through the woods down to the water. The swallows dive down in the Summer skimming the surface for a drink. Frog pond this Spring 2018! 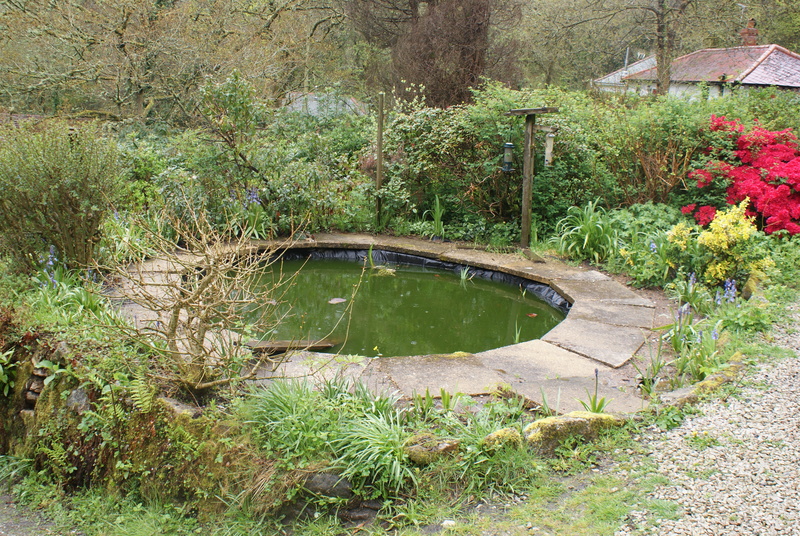 The top pond ready to burst into flower! 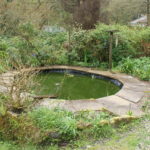 The third pond is in our garden outside our kitchen window- washing up is a real pleasure. Over the last few years the plants had taken over and it leaked so last Autumn we emptied it and replaced the old liner. 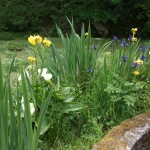 We replanted a few iris and lilies and then waited. We always look forward to late January when the pond hosts a frog mating spectacle. For a couple of weeks the pond seethes like a bubbling cauldron as the the four legged amphibians scramble around each other. But this year January came and went without a sign of a frog and February too. We were beginning to wonder if the lack of plants had put them off when at the beginning of March, just before the first snow, a handful of frogs appeared and disappeared as quickly. The pond froze for about a week. Once it thawed we hoped they’d return but to our great disappointment they never did. Until last week – the April heat wave hit and the pond exploded, turning black as hundreds of tadpoles emerged into the sunlight. It was a wonderful sight and one we witnessed with joy. We are looking forward to a mass of tiny frogs hopping around Darrynane very soon. A number of newts also inhabit this little circle of water. We see them coming up for air as we pass by. Water boatmen ski along the top and as the weather improves may and damsel flies hover over the surface. We are looking forward to the water lilies flowering, we’ve counted 6 different plants so far. 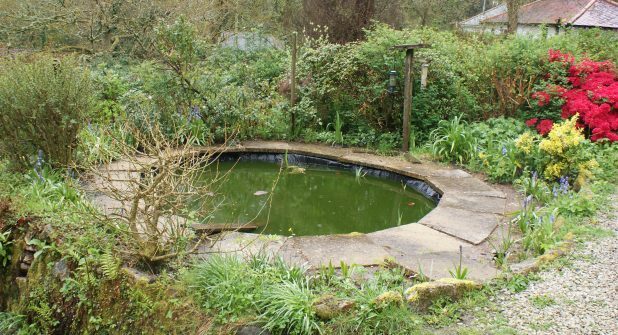 So pond life lives on and continues to thrive at Darrynane. Thank you for all those who have been to Darrynane this year or are booked to arrive at some point. We have The Lodge and Lakeside available from mid June so if anyone is looking for a break or holiday just give us a call or email.